Every year, on March 26th, people around the world wear purple to show their support for those with epilepsy and to raise awareness about the condition. Approximately 50% of children with cerebral palsy have seizures - episodes in which abnormal nerve activity disturbs the functioning of the brain. We don't typically say that Brennen has epilepsy, but that he has a seizure disorder along with cerebral palsy. Seizures are so common among children with cerebral palsy because brain injuries provide focus for abnormal nerve impulses to occur. 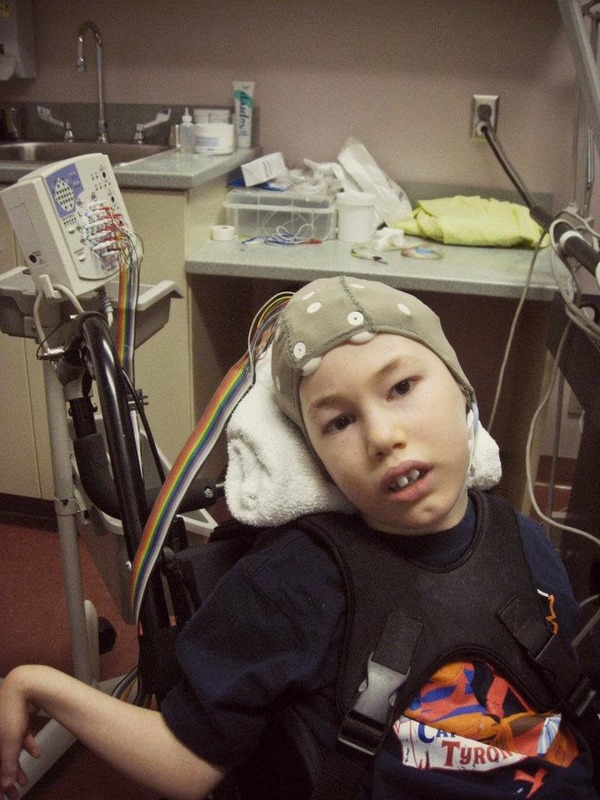 Children with quadriplegia (like Brennen) or hemiplegia are most likely to have seizures. Brennen has been having seizures for quite a few years, and though we have gotten used to them, it is never easy to watch your child go through something so traumatic. Brennen's seizures are usually short, lasting just a minute or two, and he is very sleepy afterwards. We have tried a number of different medications to try and control his seizures. Many have had side effects that we didn't like, and some just did not work for him. It is a bit of trial and error to get the proper therapeutic dose, but we seem to have found the right prescription for Brennen, and his seizures have been less frequent and less severe. I used to get texts from his teacher at school saying, "Brennen just had a little seizure. He is doing fine now, in someone's arms having a cuddle and a rest." I haven't gotten a message like that in a few months. (That being said, he had a small seizure yesterday at breakfast, and missed school because he slept the whole morning). Brennen is certainly not seizure-free, and probably never will be. We have accepted this as our 'normal', and we try to make him as comfortable and as content as possible. Brennen is followed closely by a pediatric neurologist, and has EEGs (Electroencephalograms) regularly to measure his brain wave patterns. EEGs are painless and non-invasive, and typically take about an hour. They also usually videotape his EEGs to try and record a clinical seizure on tape. Brennen has only ever had one seizure that lasted longer than five minutes. It was not stopping on its own, so I had to administer emergency medication (Ativan), which we keep on hand "just in case", and we took him directly to the hospital. He had come around by the time we got there, so they just checked his vitals, monitored him for a couple of hours, and sent us home. As scary as it is, anyone can have a seizure at any time. One in every ten people will have a seizure at some point in their life, and over 10,000 people in Newfoundland & Labrador have epilepsy right now. A seizure may appear as a brief stare, unusual movements of the body, a change of awareness, or full body convulsions. First Aid for seizures involves responding in ways that can keep the person safe until the seizure stops by itself. Contrary to popular belief, it is not true that a person having a seizure can swallow his tongue. Do not put anything in the person’s mouth. Efforts to hold the tongue down can injure the teeth or jaw. Here are some things you can do to help someone who is having a seizure that appears as blank staring, loss of awareness, and/or involuntary blinking, chewing, or other facial movements. The seizure lasts longer than five minutes. The person has a health condition like diabetes or heart disease, or is pregnant. On March 26th, wear purple in support of all people who live with epilepsy. Help eliminate the stigma and fear associated with epilepsy and brain trauma! The Canadian Epilepsy Alliance has a wonderful new website with lots of information on epilepsy and seizure disorders. Epilepsy Newfoundland & Labrador also offers a range of programs and services to meet your needs concerning all aspects of living with epilepsy.